In her sophomore offering, award-winning novelist C.J. Darlington pens a fast-moving, suspenseful tale in which a first edition of The Great Gatsby leads both to tragedy and redemption. Setting her story in the unusual combination of the American foster system and antiquarian bookselling, Darlington keeps the tension high while probing the depths of guilt, regret, desperation, and forgiveness. Runaway teen Roxi Gold hasn’t known a true home since the state removed her from her mother’s care when she was 8 years old. The foster system had not been kind to her, but recently she’d found a semblance of peace with her mother’s cousin, Irene. Recently Irene started touring the country in her RV with her son, Diego, and Roxi. What an opportunity, what an adventure—right? Except for their troubling habit of stealing rare books from various bookstores. Roxi doesn’t like it, but she fears being abandoned again if she doesn’t cooperate. One fateful day she realizes there are worse things than rejection. On that same fateful day, Abby Dawson races home to be with her family. Recently suspended from her duties as a police officer, she feels like a failure both personally and professionally. Her ex-husband has wrested away custody of their daughter, her father has never seen eye-to-eye with her, and her beloved brother has just been shot and killed—presumably in a robbery gone bad. He seems to have walked in on a group of thieves in his bookstore. If she finds the murderer, will she be restored in the eyes of her father—and in her own? Devastated by the horrible accident, Roxi flees her criminal “family” with a few stolen books she hopes to sell on her way to somewhere—anywhere Irene isn’t. Self-condemning, guilt-ridden, and scared, she finds temporary refuge on a ranch with a friendly, gentle couple willing to help. But can Roxi accept the grace they wish to give? Abby has been busy with some off-the -record sleuthing. Will she avenge her brother’s death? When the moment of truth comes, both have choices to make. 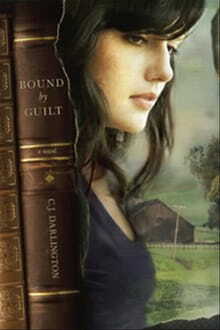 Bound by Guilt could not have been titled better. Many characters in the story have troubled pasts that threatened to suffocate their futures were it not for the intrusion of grace and forgiveness. Readers must decide if they can live with the end results for both Roxi and Abby. After a slow start, the pace eventually quickens, then never lets up. A true page-turner, this tale uses the mystery and suspense to keep readers entertained. But it’s the characters who will enthrall. Specifically, Darlington has created a completely sympathetic character in Roxi through her insightful portrayal of a broken foster system. A negligent mother, foster homes that won’t protect, and distant relatives who require criminal behavior in exchange for acceptance—it’s easy to understand why a runaway teen who is inwardly dying for love will outwardly deny her need for it. If nothing else, perhaps Roxi’s character will educate the minds and soften the hearts of readers who may one day cross paths with someone like her.